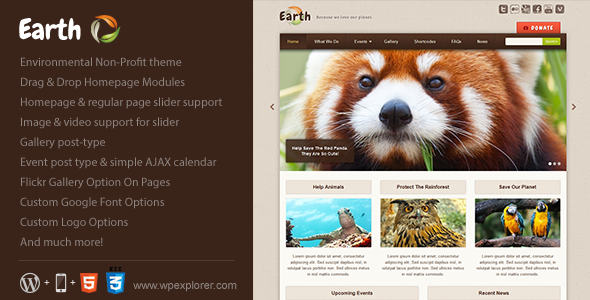 Earth is a premium WordPress theme created with Environmental/Eco-Friendly websites in mind. It’s the perfect solution for all types of business and non-profit organizations that want to add an earthy touch to their online presence. Calendar: There is a simple calendar built-in that connects with the events custom post type. The calendar basically will only show events on dates based on the event post’s meta options. You can have events that last more then 1 day but you can’t have repeating events (for this you will need to add the event for each day it’s repeated). Share the post "Earth – Eco/Environmental NonProfit WordPress Theme"